Modern digital pianos come in every size, shape, and form you can imagine (and every possible price point, too). There are portable, stage, console, and even grand digital pianos available on the market today. But if you want to get as close as possible to replicating a real acoustic piano without spending a fortune, you should definitely take a look at console-style digital pianos. Console digital pianos are perfect for home use, and while they tend to be more expensive than portable models (with similar characteristics), they also provide a more realistic playing experience. These instruments mainly focus on reproducing the sound and feel of an acoustic piano and usually come with a furniture-style cabinet, hammer-action keyboard, and 3 pedals. The good news is that today you can get a solid digital piano with an authentic sound, touch and a bunch of extra features for less than 1000 dollars. So in this article, we’re going to look at the best 3 digital pianos under 1000$ on the market (+ 2 slightly more expensive options) so that you can compare them thoroughly find the one that’s right for you. Each type of digital piano has its pros and cons, and console type is no exception. 1) The main advantage of console pianos comes from their design. Compared to portable pianos, they look and feel much more like an acoustic piano, making a nice addition to your home decor. 2) Console pianos come with a furniture-style cabinet and 3 pedals, which means you don’t need to spend extra money on a stand or pedals for your instrument, as in the case of portable pianos. 3) Finally, thanks to a bigger keyboard base, console pianos usually sound fuller and bolder compared to their portable alternatives, mainly because of the resonance effect caused by the cabinet. The main disadvantage of console pianos is that they aren’t very portable. Yes, you can still move them around much easier than traditional pianos, but you’ll probably need a second person to help you out. In any case, console pianos aren’t really designed to be moved around constantly. They provide the highest levels of performance, reliability, and realism that other brands cannot match (at least for now). Now, let’s take a look at the table below to compare and contrast the best digital pianos that made it into the list. In September of 2017 Casio has updated its Privia line with two digital pianos, the PX-770 and the PX-870 (flagship) which we’re going to talk about today. The piano comes with a number of significant improvements, including a redesigned cabinet, an upgraded piano sound, and a new 40W sound projection system. 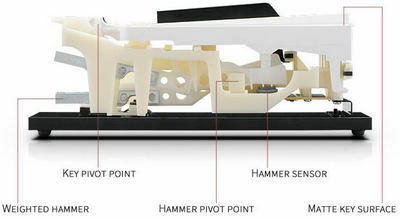 But first let’s take a closer look at the two most important aspects of any digital piano: sound and touch. The piano features Casio’s famous Tri-sensor Scaled Hammer Action Keyboard II with 88 full-size keys. The keyboard utilizes hammer action system with triple sensor detection technology, which allows for faster note repetition and greater expressiveness. 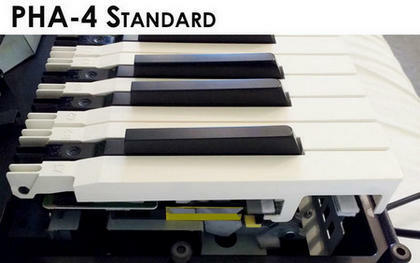 The keys of the PX-870 have simulated Ivory & Ebony keytops which provide a nice textured feel. The surface of the keys also helps absorb moisture from your fingers and enhance control. To my fingers, the PX-870’s keyboard has a nicer and more accurate feel than Yamaha’s GHS keyboard, but it also seemed a bit noisier than the rest of the keyboards on the list (esp. noticeable at low volume levels). In this price range, Casio’s hammer action keyboard II and Roland’s PHA-4 Standard are the only keyboards that utilize 3-sensor technology and provide simulated Ivory feel on the keys. The previous PX-860 model had a very good sound on its own, but the new PX-870 showed us that there’s always a room for improvement. At the heart of the PX-870 is the Multi-dimensional Morphing AiR Sound Source, which comes with an upgraded 4-layer piano tone. I must say it sounds incredibly realistic and there’re a few reasons for that. The PX-870 fully reproduces important components of an acoustic piano sound such as damper resonance, string resonance, key on/off action noise. It also has Key Off simulator, Lid Simulator, and Casio’s proprietary Hammer Response feature. All these elements do make the PX-870 sound more beautiful and realistic. Moreover, you can adjust each parameter to get the exact sound you want. The second thing that makes the PX-870 stand out from the competitors is its unique 4-speaker sound projection system with 40W of output power. It delivers a full, rich sound and can get almost as loud as a real acoustic piano. The dynamic range is also very impressive ranging from the softest pianissimo to the loudest fortissimo. Another thing worth mentioning is 256-note polyphony, which ensures that the notes will continue to sound fully and naturally even under high demand performance situations (fast passages, layered sounds, etc.). It’s the only piano in this price range that has 256-note polyphony. When it comes to features and functions, the PX-870 will not disappoint you either. Along with the standard features like metronome, transpose, dual/duo modes, the PX-870 offers 60 internal songs to listen to and play along with as well as great recording capabilities. With the PX-870 you can record your performances not only in MIDI but also in WAV, meaning you can record the actual sound of the instrument and share it with your friends and family easily. It’s the only piano on the list that offers that. Another great feature the PX-870 has is called Concert Play. It provides you with 10 different tunes, which are real recordings of a symphony orchestra. You can first practice the piano part of those pieces (each hand can be practiced separately) and then play along with the orchestra accompaniment. Overall, it’s safe to say that the PX-870 is currently one of the best digital pianos you can get for under 1000$. It has an incredible sound (really hard to beat), realistic hammer action and lots of nice features to keep any pianist entertained. It’s pleasing to see that Casio continue to improve their instruments and provide the best technology normally only available on much higher priced pianos. For those on a budget I also recommend checking out the PX-770 model, which is pretty similar to the PX-870 but the price is about 300$ lower. Even though the Korg C1 Air is slightly out of our budget range, I couldn’t help but include this digital piano on the list. Korg has just released two new digital pianos, the G1 Air (flagship) and the C1 Air, which I recently had a chance to put my hands on. Finally, I can say without any hesitation that Korg have done an excellent job and their new pianos are strong competitors in the market of home digital pianos. The very first thing that makes the C1 Air stand from the competition is Japanese Quality. Everything from making the RH3 keyboard action to assembling the complete unit is carried out in Miyama-cho, Japan, which gives the instrument an excellent built quality and reliability. The C1 features Korg’s high-end keyboard action called Real Weighted Hammer Action 3 (RH3). You may have heard about this action because Korg uses it in lots of their digital pianos and professional keyboards. I’ve had some experience with the RH3 and like how it feels and plays. It feels a bit lighter than Yamaha and Casio actions, but at the same time, it’s super responsive and smooth. Overall, I like the RH3 action slightly more than Casio’s and Yamaha’s actions but when it comes to realism, Roland’s PHA-4 Standard action beats them all in my opinion. Sound is the area where the C1 Air really shines. The instrument has a big, bold piano sound thanks to the exceptional 50W speaker system and high-quality piano sounds sampled from German and Japanese grand pianos. A realistically recreated damper resonance and key-off simulation add even more realism to the playing experience. 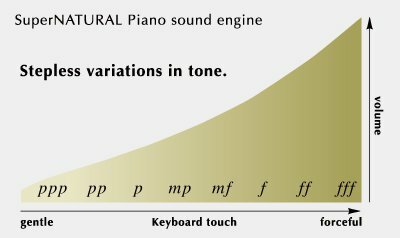 In total, there are 6 different piano tones as well as 24 other instrument sounds including organs, electric pianos, strings, harpsichords, guitars, etc. I’m glad that Korg decided to add a few important features and functions that are missing in the B1 such as onboard recorder, lesson function, MIDI connectivity, etc. The C1 has a 2-track MIDI recorder and 40 preset songs that you can use to independently practice right- and left-hand parts. Korg has decided to stick with traditional MIDI In/Out ports, so you won’t find a USB port on the piano. You can still connect the C1 to a computer and use it as MIDI-controller with the help of a MIDI-USB adapter. “Air” in the name of the piano implies that you can connect your smartphone or any other Bluetooth device to the C1 and play your stored music through the piano’s speakers. You can also play along on the piano as a recording is playing back, which is very convenient. Wrapping up, the C1 Air is one of Korg’s most capable and well-balanced digital pianos, which I believe will be a very popular choice in this price category, considering the value for money it provides. Yamaha is probably the most popular manufacturer when it comes to budget-friendly digital pianos. The company’s updated YDP line (2016) consists of console digital pianos that offer realistic piano playing experience for an affordable price. That’s why they’re pretty much in demand on the market. The YDP-143 is the middle model in the YDP series (YDP-163 – next model up; YDP-103 – next model down), which primarily targets intermediate piano players. The piano comes with a cabinet and 3 pedals. It’s the heaviest piano on the list (83.75 lbs) and slightly deeper than its competitors (depth: 16.6”). If you take a closer look on the inside of the YDP-143, you can see that it’s very similar to the portable Yamaha P-115. The pianos share the same sound engine, the same action and have an almost identical set of features. The YDP-143 is equipped with 88 full-size touch-sensitive keys that use the Graded Hammer Standard (GHS) action (Yamaha’s most affordable fully-weighted action). The GHS provides a fairly realistic feel with a lighter touch in the upper range and heavier touch in the lower range. The white keys have regular shiny keytops, while the black ones have a black matte finish and are less slippery when playing for long periods of time. Although the GHS is nothing exceptional, it’s still a decent fully-weighted action that feels similar to an acoustic piano and designed to meet the requirements of beginners through to intermediate players. The YDP-143 is equipped with the Pure CF sound engine. It provides 3 different piano tones sampled from a full concert Grand Piano (CFIIIS 9′ Concert Grand) as well as a bunch of other instrument sounds including a pipe organ, electric pianos, harpsichord, strings, etc. But what interest you the most is probably the piano sound. Well, there’s nothing to worry about here because the YDP-143 sounds amazing. Thanks to the high-quality samples, 192-note polyphony and Yamaha’s latest technologies for sound optimization (Intelligent Acoustic Control, Stereophonic Optimizer, Acoustic Optimizer), the YDP-143 offers a very rich and realistic sound through both headphones and 12W onboard speakers. Speaking of speakers, even though the YDP-143 has slightly less powerful speakers than the P-115, it sounds bigger and more resonant thanks to its cabinet design. As far as features go, I’d say the YDP-143 does a good job and provides enough to keep you interested. The piano has a metronome, duet mode, layering function, 2-track MIDI recorder, and lesson function with 50 preset songs to practice right and left-hand parts independently. Moreover, using a USB port, you can connect the piano to a computer/iPad and use it as a MIDI-controller with various music-making and learning apps. 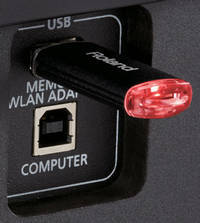 Using USB, you can also load up to 10 User Songs into the instrument and use them in the same way as preset songs. The YDP-143 is also compatible with Yamaha’s Digital Piano Controller app, which will allow you to easier and more convenient control the instrument. The things I didn’t quite like about the YDP-143 is a limited range of sounds (10), and not many options to adjust the parameters of sound except for 4 reverb types. That said, the YDP-143 is an excellent option to consider for anyone who is looking for a high-quality home digital piano with an impressive sound and attractive price. This is another newly released digital piano and a worthy addition to Roland’s RP series of home digital pianos. Up until now, Roland didn’t offer any digital pianos under 1000$ except for the FP-30. But since this is a sweet price range, which is very popular among beginner and intermediate players, Roland has decided to join the game. The RP-102 is almost identical to the FP-30, as far as piano playing goes, but unlike the FP-30 it comes with a cabinet, 3 pedals and a whole bunch of preset songs. Even though the RP-102 doesn’t offer many bells and whistles, it does an excellent job of recreating the sound and feel of an acoustic instrument. The piano features the PHA-4 Standard keyboard with Escapement mechanism and Ivory feel keys. It’s the latest generation of Roland’s hammer actions, which have become even more realistic and less “noisy” compared to the 3rd generation. The PHA-4 Standard uses triple sensor detection system, which allows for more accurate key repetition sensing and better expression. The escapement mechanism simulates that unique clicking sensation at the end of a stroke found on a grand piano. The Ivory textured keys aid control and help absorb moisture from your fingers. To my taste, the PHA-4 has the most realistic touch at this price point. And only the Kawai KDP90 with its AHAIV-F action, will probably be as good. But it will stretch the budget a bit. At the heart of the piano is Roland’s unique SuperNatural modeling technology, which is known for delivering a very full, rich piano sound with seamless dynamics. Some people like the sound, some people find it a bit too bright and metallic. I personally like the rich sound of Roland pianos. It’s very dynamic, powerful, and has its own character. Moreover, the RP-102 and the PX-870 are the only pianos in this price range that simulate sympathetic string resonance found on an acoustic piano. The RP-102 probably doesn’t have as many features as the other pianos on the list, but thanks to its great connectivity (USB, Bluetooth) you can easily expand the capabilities of the instrument using various music apps such as FlowKey (for learning songs), GarageBand (for creating music), Logic Pro X, etc. Moreover, Roland has designed a great app called Piano Partner 2 (available for both iOS and Android devices). Using this app, you can quickly access all the functions and songs on the PR-102 as well as display the scores of preset songs, develop your note-reading skills using the Flash Card game and much more. The most important thing is that the app also allows you to record your performances in MIDI, which is particularly useful for the RP-102 as it doesn’t have an onboard recorder. Speaking of built-in songs, the RP-102 has over 200 songs that you can listen to and play along with. Unfortunately, it doesn’t have a lesson function, which means you can’t turn off R or L track of a song to practice each hand part separately. But apps like FlowKey, Synthesia, etc., will easily solve that problem. With all that said, I definitely recommend checking the RP-102 out for arguably the best keyboard feel and impressive sound as well as a variety of connectivity options. The LP-380 is another popular digital piano on the market and a great alternative to the C1 Air for those with a limited budget. Until recently, the LP-380 was a flagship model in Korg’s range of home digital pianos. But even now, after the G1 Air and the C1 Air have been released, the LP-380 is still a worthy piano with an appealing price. The piano features the same RH3 keyboard action as the C1 model. It also uses the same PCM sound engine, has 120-note polyphony and 30 built-in sounds. Unfortunately, the LP-380 doesn’t have the new piano sounds of Japanese and German grand pianos found on the C1, which, as I said, are quite impressive. But even with the “regular” Grand Piano sound and slightly less powerful speakers (2 x 22W), the LP-380 sounds more than decent. The LP-380, just like the C1 Air, is produced in Japan, which means you get the same exceptional Japanese quality for an even better price. But the truth is “you get what you pay for”, and with a lower price also come some limitations. In particular, the LP-380 doesn’t have a built-in MIDI recorder or lesson function. There are 30 built-in songs (10 demos and 20 piano songs), which you can play back and play along with but you can’t change the sound of a song or turn off one of the tracks (R or L) to practice a one-hand part. Connectivity also isn’t something the LP-380 is very good at. There are no Bluetooth support and more importantly no USB ports to connect to a computer. 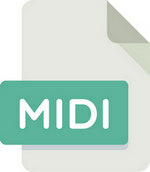 Instead you get MIDI In/Out ports, which you can also use exchange MIDI data with your computer. 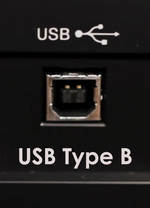 But a MIDI-USB adapter needed for this connection is pricier and harder to find than, say, a USB A to B adapter, which you get at any electronics store for less than 5 bucks. The rest of the connectors include two headphone jacks and Line Out jacks for connecting to external speakers, amps, etc. Overall the LP-380 is a great quality instrument with a natural sound and feel as well as compact design. It would be best suited for progressing students as well as recreational players who need an alternative to an acoustic instrument with minimal features and a fair price. Well, our top 5 list is based on what we believe are the best home digital pianos under $1000 available on the market. Holy cow, You finally updated your list! Glad to see Casio getting the respect they deserve finally! That PX-870 is hands down the best bang for the buck of any piano on the market. Hi Pete, thanks for your comment. The PX-870 was there from day one! And I agree it presents a very good value for the money. Excellent. Thanks for the review. Hi Lucas! Thanks so much for this. Your website is very helpful. Question for you: How do you compare the Casio PX-870 with the PX-860? I found a PX-860 for $675 US and I am wondering if it is worth it. I am a beginner but I would like to buy a piano that will be good for at least a decade. I am mostly attracted to the 256-note polyphony. Thank you! Hey Rachel, well both of these pianos have 256-note polyphony, however, I wouldn’t get too excited with this characteristic as there are more important things that should be taken into account (key action, quality of samples, decay, resonance, etc). The PX-860 and PX-870 share the same key action and a lot of other features. I’d encourage you to read my full review on the PX-870 so that you can get an idea of whether it’s worth paying extra for it or not. But, in my opinion, if you were able to find the new PX-860 for as little as $675, go for it, because the extra features you get on the PX-870 may not be worth the extra money. However, I still prefer the new piano sound on the PX-870. Thanks so much! Ended up going with the PX-870 and I am very happy with it. Keep up the good work and thanks again! You’re welcome! Glad you’re enjoying the instrument! Dittos on the many positive comments posted throughout this site on your reviews and helps. Outstanding. I’ve learned so much. Greatly appreciate the content as well as the format. 1) Any plans to review the Kawai KDP110? 2) The Casio AP-270? 3) Any plans for a Best DP in the $1000-$1500 range? 4) I like what I’m learning about the Casio PX-870, except I have concern over the keyboard noise being somewhat louder than competitive models, particularly at low volume. Im struggling to relate to that since I’m a total newbie and have no point of reference as whether that might be bothersome or not. IOW, how perceptible is that noise? Enough to deter from purchasing? I haven’t had the chance to hear a PX-870 yet. Finally located a dealer about 1.25-1.5 hrs away. Wondering if I should consider something else, or make the drive to hear it? Who knows, maybe I won’t even pick up on it? Hey Craig, thanks for the kind words. 1) Review of the Kawai KDP110 is coming soon. 3) There’re 3 top lists that I’m planning on writing including “Best Console DPs under $1500”, “Best DPs for advanced pianists” and some others, but every post I publish takes a huge amount of time to write and publish, so I have to prioritize. I’ll try to keep a pace of one post per week but that won’t always be the case. 4) The noise is definitely not a deal-breaker as it’s comparable to other models in this price range, which also have some key action noise (all of them have). It’s just Casio’s Tri-sensor scaled hammer action II tends to be slightly noisier in low-volume situations compared to other brands such as Roland or Yamaha, which may be a bit uncomfortable for other people in the room listening to the noise while you’re playing in headphones. When using the onboard speakers, the noise will unlikely be audible unless you’re playing at low, low-medium volume. As you said, chances are you won’t even notice it but it’s better to be safe than sorry, so I’d definitely recommend trying the piano out in person if you have that option. Amazing review! I think Yamaha ydp-143 is the best choise for me. Thanks! Amazing comment! Glad you found the instrument you like. Great choice! Awesome article here. Super super helpful. Which one of these would you rate to have the best most realistic acoustic piano sound? Hey Tou, it’s really difficult to answer your question since it’s all so personal and subjective. They all sound great for the price, the PX-870 and C1 Air have more powerful speaker systems, so will probably outperform the others (in volume and boldness) when listening through the onboard speakers, but when listening via headphones… You really need to listen to their tone yourself, as in my opinion there’s no clear winner here. I personally like the Casio and the Roland, but they’re all quite good honestly, so I don’t think you will be disappointed with any of these pianos’ sounds.